I have many blessings in my life. I am blessed every day to have two amazing girls who call me mommy. I have amazing parents who have been married for over 40 years. I have 3 sisters(also 2 sister-in-laws) and 2 brothers(also 2 brother-in-laws). They have given me 7 amazing nephews! Most of my family does not live near me but I love the new technology that allows us to stay in touch by email, phone and Skype. I feel incredibly blessed to have such close relationships with all of my family. I used to work in the office as an auditor for 5 years and then after having our first blessing we decided it would be best if I stayed at home with her. Then 3 1/2 years later we had our second blessing. Now my oldest is going into 2nd grade and I am now teaching my youngest about her ABC’s and 123’s to prepare her for kindergarten in 2 years. It is so true what they say about it going by so fast. Being a stay at home mom has many rewards! The number 1 being you get to see more of your kids but there are also struggles. At times I feel worn out and feel like laundry and dishes never end. Staying at home has taught me to juggle it all! I have become the parent, cook, house cleaner, kid’s chauffeur, nurse, teacher, councilor, motivational speaker and so much more! Being a mom is a lot of work. It is a 24 hour a day job! It truly is rewarding though! Those beautiful smiles and echos of what you say because they want to be like you. The cute little voices that say I lubby you mommy! Totally worth it!! Update: Now both of my girls are in school and I have been blessed with a job in the school system so I am able to have the same schedule as them throughout the school year and have summers off with them. Time has just flown by and I do miss being home with my girls but I feel good about being able to help other children with learning new things and hopefully being a positive influence in their lives. Children just bring so much joy into this world. I thank God everyday for my blessings and pray that He helps me be the best Mom, Daughter, Aunt, Sister and Friend I can be. 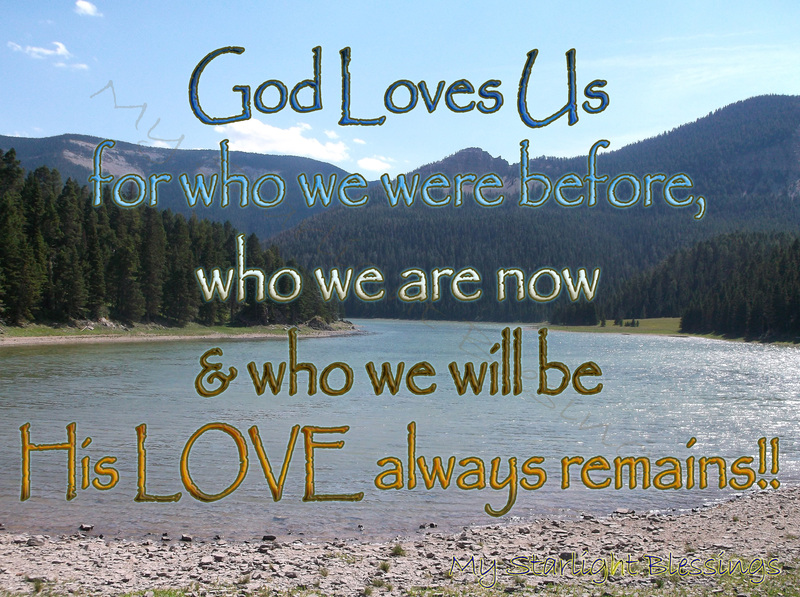 It is so great that God loves us for who we are, forgives us and helps us be better people. I will have struggles and have had struggles in my life that come without notice and I have been hurt and I have had fears of the unknown. When I remember that Gad has promised to take care of me and provide for me. When I give all of my burdens down at His feet I am at peace!! I hope that I can provide you with uplifting messages and verses to help remind all of you about the promises God has given to us! We don’t have to be perfect. 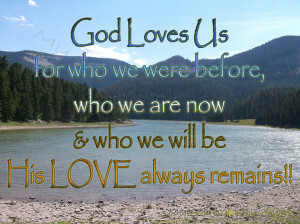 GodLOVES us for who we were before, who we are now and who we will be! He may not always like what we do but His love will always remain! If you have not figured out what this blog is all about it can be summed up in one word LOVE(not always perfect but unconditional love for my family and the perfect love of God)! I blog about my families journey in life trying to eat healthier, exercising, our faith, life’s ups and downs and living the life we were given to the fullest! I hope that you can learn from everything that didn’t work for my family and learn from everything that has worked great for my family! I also blog about our experiences with technology, video games, apps, movies, toys, food, traveling and entertainment.Thank you for coming to My Starlight Blessings and I hope you have a great year! God Bless!! This is for all of my wonderful readers. I want to let you know that all of my posts are 100% my own and are written with my honest opinion but there are times(not always) when I am compensated by receiving a free product,free experience or by receiving money for my honest review. This is my promise to you. Even if I am compensated I will never promote a product I don’t believe in. If I try a product and find things that did not work for me I will be completely honest and express that in my writing. I am dedicated to helping companies reach their dreams and helping people find what they are looking for. I don’t think a company is able to reach their dreams unless they hear honest feedback and I don’t think people can find what they need unless they read an honest review! My Starlight Blessings is not responsible for prize fulfillment on giveaways. I would not have partnered with a sponsor if I did not think you would get your prize but unfortunately things do happen and you may not receive it. I will try and reach them and do my best to make sure you get it but I can not make them give it to you. If it has been a month and you still have not received a prize contact me and I will do my best! Thank you for following My Starlight Blesssings!